Food and diet in Russia has been shaped by one major force: the climate. With their long, dark winters and temperatures that can fall as low as negative 40 degrees Fahrenheit in some regions, Russians turn to cuisine that's largely based on long-lasting cold weather crops, and traditional dishes are dense with carbohydrates and fats. The typical Russian diet contains less fresh produce and more saturated fat and sodium than is recommended by the U.S. Department of Agriculture and the Centers for Disease Control and Prevention. The typical Russian breakfast contains whole grains and is high in protein. Common dishes include a hot buckwheat porridge known as kasha and toast or open-faced sandwiches accompanied by ham, sausage, eggs or cheese. The bread is typically prepared from ground whole wheat, buckwheat, barley or rye and is often spread with butter. Fruit is seldom served since fresh produce is difficult to obtain in many parts of Russia. If you're having a Russian-style breakfast, skip the processed and cured meats in favor of a boiled egg served with your bread or porridge. Lunch is the largest meal of a typical Russian's day and is served later than in most Western countries, usually around 2 p.m. This meal traditionally consists of three courses, beginning with a serving of hot soup. The second course is roasted meat or fish paired with potatoes or bread and vegetables such as cabbage or turnips. The final course is centered around a hot drink like coffee or chai tea and may be accompanied by a dessert. 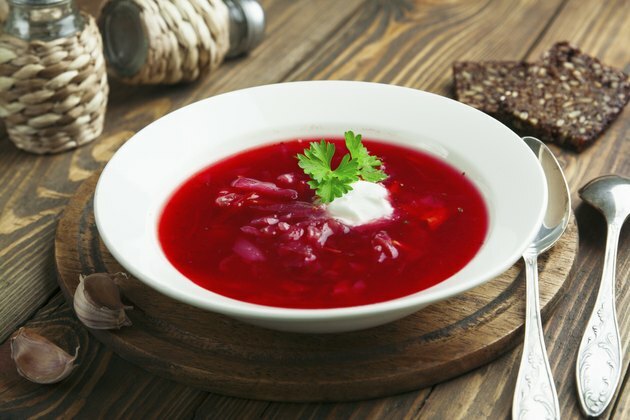 For a healthy Russian midday meal, choose a broth-based soup rich in vegetables like borscht and roasted fish with whole-grain bread instead of potatoes. Russian dinners may begin with a selection of appetizers known as zakuski. These appetizers can range from bread with cheese to salads to pickled vegetables. Russian salads typically contain cooked potatoes, eggs and vegetables mixed with a mayonnaise-based dressing. For the healthiest zakuski, look for smoked fish or selodka, which is herring tossed with vinegar and oil. The meal's main entree is similar to lunch, consisting of roasted meat or fish and potatoes. Dinner may conclude with sweetened tea and, possibly, a dessert. In Russia, a typical day's meals might end with a final serving of tea or coffee consumed as late as 10 p.m. The hot beverages are traditionally served out of an elaborate urn known as a samovar and can be accompanied by desserts such as cake, chocolates or cooked fruit. When you're participating in this last meal of the Russian day, keep your calorie intake under control by drinking your tea or coffee without any added sweetener. Choose a fruit-based dessert and pay attention to the portion size.